We’d love your help. Let us know what’s wrong with this preview of A Taste of Winter by Laila Blake. Picking up where BY THE LIGHT OF THE MOON left off, A TASTE OF WINTER is the second book in a romantic paranormal fantasy trilogy, set in alternate history medieval times. It follows the life of young Moira, a half fae noblewoman who fell in love with her shape-shifter guard and ran away from her ancestral home. Traveling the country, searching for a safe place to stay, th Picking up where BY THE LIGHT OF THE MOON left off, A TASTE OF WINTER is the second book in a romantic paranormal fantasy trilogy, set in alternate history medieval times. It follows the life of young Moira, a half fae noblewoman who fell in love with her shape-shifter guard and ran away from her ancestral home. Traveling the country, searching for a safe place to stay, the two of them soon realize that life is not as kind to them as they might have hoped. They feel the sting of prejudice and bigotry in each town they visit, and the reality of poverty and winter begin to erode Moira and Owain’s blossoming love. To ask other readers questions about A Taste of Winter, please sign up. I've rarely seen an author stick with the same couple throughout a Paranormal Romance series, and even though Moira & Owain’s HEA wasn't 100% resolved when BY THE LIGHT OF THE MOON concluded, it had still reached a point that I was satisfied with. In this installment readers reconnect with the love struck duo who are now on the run because of their taboo mating, and although I enjoyed a number of aspects of this story, as a whole I found it somewhat lacking in the ex Reviewed by: Rabid Reads. I've rarely seen an author stick with the same couple throughout a Paranormal Romance series, and even though Moira & Owain’s HEA wasn't 100% resolved when BY THE LIGHT OF THE MOON concluded, it had still reached a point that I was satisfied with. In this installment readers reconnect with the love struck duo who are now on the run because of their taboo mating, and although I enjoyed a number of aspects of this story, as a whole I found it somewhat lacking in the excitement department. I liked learning more about the heroine's origins, the fae elements were fascinating, and Laila Blake's werewolves are undoubtedly smexy, however three quarters of this novel revolved around the protagonists bumbling their way through the woods which was... boring. As a result, A TASTE OF WINTER didn't quite live-up to this series' debut. Due to publications issues, the time elapsed between the first and second installments was pretty significant, so I was happy that the author gave me ample opportunity to refamiliarize myself with the characters, and her LAKESIDE universe. I liked that we got to peek-in on Maeve, Moira's mother, and gain a better understanding of her coloured past. She and her daughter have something in common in that they both fell in love with an off-limits male, but that's where their similarities ended because Maeve's tale is as far from happily-ever-after as you can get. Her character had to make some really tough decisions, and sacrifice her own romance for her children's safety; I had previously doubted her motivations, however that's no longer the case. I was also pleased to discover that not all of Blake's fae are evil. The chemistry between Moira & Owain was one of the high points of book 1, and I enjoyed this element even more the second time around. My main complaint about the previous installment was the lack of bedroom action, so I was thrilled that the author poured on the steam in this latest addition. The couple underwent an interesting role reversal too because the Blaidyn gets captured, is severely injured, and the heroine is forced to not only save his werewolf hide, but also nurse him back to health. This showed great character growth on Moira's part, she's come a long way from the soft noblewoman she started out as in BY THE LIGHT OF THE MOON. That being said, after a while this shift got old, I missed Owain's alpha maleness, and the one-the-run story line grew rather tiresome after 150+ pages. Once the POV shifted to Rochmond's castle, things got a lot more interesting. I disliked Brock/Brody in the first novel, but in this one I downright hated him! The author succeeded in creating a loathsome villain while also weaving in some gripping fae politics, it's just too bad that this aspect wasn't at the center of the plot. I'm sure you're all familiar with changeling lore, however Blake added a unique twist which was downright freaky. I wasn't overly fond of Iris in the previous book, but her character definitely redeemed herself in this tale. Niamh's intentions still remain unclear, and I confess that I'm not exactly sure how this trilogy is going to end. Two babies are born, one of evil and one of light, but unless some major time jumping happens I can't see how either of them will determine the fate of LAKESIDE. After the first book, I couldn't wait to read more of Moira and Owain's adventures! A Taste of Winter had me enthralled and intrigued from beginning to end. And although the plot is slightly less complex than the first book, it is a gripping read, and a meaningful addition to the series. Owain, a mysterious Blaidyn; and Moira, a human/fae hybrid were last seen fleeing Castle Richmond, and have now set out on a journey as an eager couple, young and in love. But quickly, Moira learns that life out After the first book, I couldn't wait to read more of Moira and Owain's adventures! A Taste of Winter had me enthralled and intrigued from beginning to end. And although the plot is slightly less complex than the first book, it is a gripping read, and a meaningful addition to the series. Owain, a mysterious Blaidyn; and Moira, a human/fae hybrid were last seen fleeing Castle Richmond, and have now set out on a journey as an eager couple, young and in love. But quickly, Moira learns that life outside the safety of the castle isn't all wondrous. Instead, there are hardships in living a life on the run, and extraordinary challenges in surviving the winter season. Further, Moira is unprepared for the prejudices they encounter as an interspecies couple -- from both human and fae -- which tests the love between them. The scheming fae spy, Brock (Moira's disguised, wise tutor), has proven more sinister than ever. The extent of his plans for both the fae and the human world slowly reveals his true madness. As we learn the backstories of various characters, and as Brock's plans unfold, the true depth of the story is revealed, which drives the plot, and brings insight into the story. What is exposed is a heartbreaking journey that lead us back to our hero and heroine. Watching the evolution of the characters was an extraordinary experience, as each is confronted with how to cope, and how to adjust to a new way of life. One such moment is observed as Owain, both strong and proud, struggles to provide for Moira. Slowly, it chips away at him, testing his confidence, and revealing his deepest vulnerabilities. He questions his ability to care for Moira, and I couldn't help but grow fond of Owain through his struggles. Moira experiences the most profound and inspiring transformation. This sweet, innocent young woman has to find her own inner strength to became a steady force, both as a woman, and as the backbone of the relationship. I was so proud to see her come into her own, and squealed with happiness when she faced off with Owain, stating, "You don't get to decide when I'm done loving you." I cried, and I cheered for their love. I wasn't sure how strong their love would prove to be, but now I'm a firm believer! This story is all about growth, fighting for what matters most, and sacrifice. Thank you to the lovely Laila Blake for providing me with an advanced reader copy of A Taste of Winter. The story was nothing short of amazing, and I can't wait to find out what will happen next! I do like the covers in this series and the way in which they both tie in with each other but also they are different which makes sense as they are different books. I do prefer the first one to this one though as this one you can really tell they are hand drawn unlike the first one. When I first started this book I wasn't sure I was going to like this second book but I kept going hoping that it would get better and I'm really glad it did it just took a little longer than I would've liked. I seemed to be able to get through this one a lot quicker than the first one which is always a plus in my eyes. I loved that we got to see more of Laila and Owain together but there was times when I just didn't believe in their connection. I was able to stay with the story with the change of point on view throughout the book which I think is because I was able to get used to it in the first book and then I read this book straight after which I don't usually do. There was a scene that happened that came out of nowhere and then seemed to have not happened in the next moment which did confuse me a bit. With this book I felt like it was a bit to predictable as I could tell how it was going to end before I even read the last page. The end of the book did leave me wanting to know how everything is going to get resolved. I felt that most of the characters grew up a lot in this book especially Moira, I just didn't like it sounded like even though she said she didn't blame Owain for what was happening she wouldn't have kept thinking about it but really it wasn't his fault as it was all to protect her. I felt sorry for Owain throughout this book as he really did feel like everything was his fault and then with everything happening to hurt his pride more and more I'm surprised he was able to even get up in the morning. A Taste of Winter picked up a little after By the Light of the Moon left off. Our heroes are on the run, and have no where and no one to turn to. There is more Faerie meddling, some family drama, and a whole lot of prejudice for them to shift through. But Moira and Owain are strong, and together they just might have what it takes to survive. I really loved book one, and was super excited to be able to read this one. If you know me and books, then I am sure you have heard me say how picky I am when it comes to faerie books. The ones where they are more true to mythology, the ones more deviant than the happy fluffy butterflies you sometimes see, are the ones that appeal to me. If an author "messes it up," I just cannot get into the story, no matter how well written and loveable it is. But Laila Blake pulls out everything I love in a Faerie story and twists it to make it her own. So it's little wonder I love this world she created. I loved the faerie/human history. The more I learned about this war, the more I learned the tensions between the two -three if you counted the Blaidyn- the more I enjoyed the novel. The Blaidyn may be my favorite of the three groups, in part because I do love a good wolf shifter. But it's more than that. I love how the two aspects of the human and wolf come together. You can see the effects of the Fae's meddling as it directs their nature, and their culture. I still really love Moira's character. This is not the same girl who sat in her down and clawed herself because of her neurosis. She may still be a bit naïve overall, but she is learning. More importantly, tries. For a girl who was always given everything she wanted, she now needed to learn how to survive with little to no coins, and what little supplies she gathered from nature. As if it could not be worse, she has to do it in winter. There were several points in this book that you just had to complement her resourcefulness and her drive. I'm not sure I would have had the strength to combat the elements and the harsh treatment from complete strangers. I <3 Owain. There is something about him that makes me want to cuddle him. From book one, you knew he has had it rough. Between his pack drama, and human/fae animosity, he has managed to make something of himself. But when he is "forced" to provide for Moira, he struggled. He is a strong male, resourceful and knowledgeable, but his own actions at the end of By the Light of the Moon, protecting Moira, turned popular opinion of Blaidyn for the worse. He would do anything for her, would sacrifice his honor to protect and ensure her survival. So watching him struggle, watching him lose his confidence was really moving. Even the strongest of us have low moments. If you are looking for a cute new adult novel with faeries and shifters, then you may like this series. I cannot wait to find out how everything will wrap up in book three. The next book cannot come soon enough. I really enjoyed the first book in this series, so was happy to receive a review copy of A Taste of Winter from the author. I admit, I wish I had re-read the first book before beginning this one, just to refresh my memory on all the different characters and their relationships. It took me a few chapters to settle back into the story-world. Once I did though, it was smooth reading. It's not a fast-paced novel, but the characters are in new situations and are growing as a result. I especially liked I really enjoyed the first book in this series, so was happy to receive a review copy of A Taste of Winter from the author. It's not a fast-paced novel, but the characters are in new situations and are growing as a result. I especially liked seeing how Moira adapted to living on the run with Owain. She was the most changed character, although Owain showed more vulnerability and openness as well. A lot of scenes took place away from Moira and Owain, and showed the goings on back at the castle, where Brock/Brody was still working on his devious plan to become the next Lord. This sub-plot lead to a surprising ending and a possible time-jump in Book 3. The early scenes with Maeve (Moira's mother) and Ronan helped to fill in more background story, but some scenes in other minor characters' points-of view were a bit distracting, I felt. Wow talk about a killer ending there isn’t a cliffhanger or anything like that but definitely more questions that need answering and some of our fav characters find themselves in trouble. Throughout this book we see Moira grow she starts off as the meek “Lady” who always felt like an outcast, by the end she is quite the opposite. Winter was hard on Owain and Moira it was nice to see them overcome the judgement and hate. The love these two share is pure and complete I wan’t for them to have their ever after so much it hurts! I’ll be cheering for these two and hope they overcome their last hurdles. We found out a lot of characters histories and why they are the way they are, I hope in the last installment those that need to change do. 4.0 Winter, Cold, Glow, Lyre, Cabin, Nightmares, Connection, Pillow, Drunks, Love, Fire, Wolf, Hut, Week, Earrings, Halla, Mother, Sister, Conspirator, Fae, Blaidyn, Lake, Lord, Maid, Cabin, Love filled stars! The intrigue and adventure is upped in this sequel to By the Light of the Moon. Now that Moira and Owain have escaped Brody's clutches - so they think - it's up to them to find their way in the world. They find out quickly enough that it's not so hospitable to a love of their kind, and must struggle against ignorant human forces and Fae magic threatening them from both sides. Moira and Owain's love for one another blossoms and begins to grow despite the harsh winter. There is a sweetness despite The intrigue and adventure is upped in this sequel to By the Light of the Moon. Now that Moira and Owain have escaped Brody's clutches - so they think - it's up to them to find their way in the world. They find out quickly enough that it's not so hospitable to a love of their kind, and must struggle against ignorant human forces and Fae magic threatening them from both sides. There were four main plots here—Moira and Owain; Maeve and (briefly) Ronan; Iris and Brock/Brody; and Devali and Niamh. That tended to make it a little hard to track but once you got the hang of it, it ended up being really easy and entertaining flipping between the plots. Maeve and Ronan’s story is heartbreaking, as always. Maeve is an incredibly interesting character that I can relate to, because while she is Fae, she acts as much as a human as she can without being a human. Her life is full of sadness and sacrifice, and she’s still fighting for her daughters. Moira and Owain are the light to the darkness that is going on, though the darkness tends to encroach on their light for much of the book. Their love is what keeps me hopeful that things will end well for them, though I never know. Owain is the tortured, loving hero and Moira is the hopeful, lively heroine that brings light to Owain’s darkness. I slowly warmed up to Iris in this book. In the last book I didn’t know what to think of her, but here I definitely felt for her and now I desperately want a happy ending for her. Brock/Brody, however, is a fae I have quickly come to despise. This power-hungry fae will stop at nothing to get what he wants. The fact that he despises humans makes his plan so much easier for him to execute, but leaves me feeling like he’s heartless. Which he is, completely. I really liked Devali, though I don’t care for her blind devotion to Niamh. She’s sweet, though, and really wants to help, which is endearing. I still don’t know how I feel about Niamh. Her past is something I’m not sure I can get over, and when I find myself warming up to her, she does something that makes me dislike her all over again. Ms. Blake writes a convincing, relatable, and original story. I read the book and couldn’t put it down until I found out how everything worked out. Her characters have flaws, which makes them people you can relate to, or at least understand their motives. Her story is refreshingly original, with a world that will make you want to stay in there forever. Moira and Owain are still trying to learn to live outside the castle and they run into a lot of prejudice people. They call Moira a wolf whore and it makes it hard for Owain to find work. Feeling like he has let her down, he feels like he has no choice but to rob criminals only to learn those criminals have plans of their own. They attack and attempt to kill Owain with plans to do Moira next. Moira finds them and calls to Owain's wolf inside him to take over and save them both. Afterwards Owain Moira and Owain are still trying to learn to live outside the castle and they run into a lot of prejudice people. They call Moira a wolf whore and it makes it hard for Owain to find work. Feeling like he has let her down, he feels like he has no choice but to rob criminals only to learn those criminals have plans of their own. They attack and attempt to kill Owain with plans to do Moira next. Moira finds them and calls to Owain's wolf inside him to take over and save them both. Afterwards Owain is very hurt and unable to protect Moira. Moira's fae mother senses she is not well and seeks her out. Years ago she was forced to have her second born child raised by the human nobleman to save her from her fae people. Her first born child was tortured and became a shell of the child she use to be and she didnt want to fail another child. Now she will sacrifice herself for her daughter by turning herself into her fae people in hopes they will leave her daughter and her love alone. 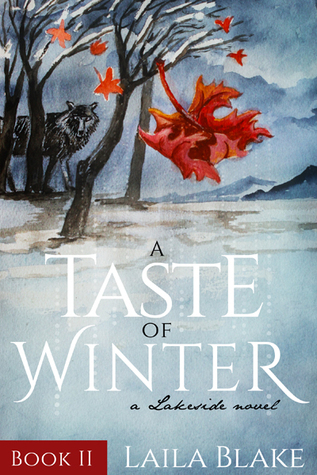 Four definitive plots unfold within “A Taste of Winter”, most of them bleak. Read full review in the 2015 March issue of InD’tale Magazine. Please find me on all those fun other places we can connect with each other!